With your donation you help us help the library. There are many options, it’s as simple as filling out the form. A charitable tax receipt will be issued for donations of $15 or more. Every donation is appreciated and important to us. If you wish to have your donation directed to a specific branch or use, let us know. We’d be happy to make it happen. 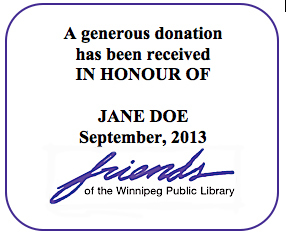 What better way to remember a special time in your library life than with a donation? Paying it forward is it’s own reward. We ask you to consider a specified monthly donation amount, easy for you and allows us to do long term planning. A gift in one’s name is always meaningful. Mark a special occasion; remember or honour a beloved family member, a respected friend or colleague. To make it extra-special, we offer a personalized Book Plate with your gift. Select a book that has special meaning and the book plate will always be there. Designating Friends of the Winnipeg Public Library as the charity where memorial donations may be sent is helpful to those who would like to give a gift in memory of a friend or colleague. Want to leave a gift or part of your estate to benefit the Library for future generations? When you are making your plans, we would ask that you consider including Friends of the Winnipeg Public Library. Donating stocks and securities is very advantageous to both the donor and Friends. CanadaHelps.org receives, manages and receipts these types of donations for us.